owls about that then! : A good day got better! Saturday morning proved to be a really busy one, I hadn't got all day because I was being picked up by Daz at 12.30pm to go up the footie and watch the mighty Leicester City in a local Derby against near rivals Coventry, boo hiss!. Therefore I was up and out early, the morning light was good, but it was forecast to get dull and wet so time was of the essence! My main aim was to check as many local sites as possible for confirmation of pairs in residence, any sites that do have pairs then become priority for monitoring during the breeding season. I started off by visiting the nearest Little Owls to where I live, site No 101. The owls at this site have been very elusive of late, but I needn't of worried as the resident pair were soon located in the nest tree. I was hoping for an opportunity to get an image of both of them together, it didn't happen so I had to make do with just the single bird, below. The next destination was my site No 58, only a single owl was noted here but at least he posed for a few seconds on top of a post for an image. On my travels owls were also noted at my site No's 12, 21 & 22. No images were possible because the owls were too far away and I hadn't got the time to sit and wait for them to get closer. At my site No 19 really close up views were had of the resident pair as they sat cuddled up together in a crevice, I am very pleased with the image (below ) but more importantly after making dozens of visits this is my first sighting of the owls here since April of last year. 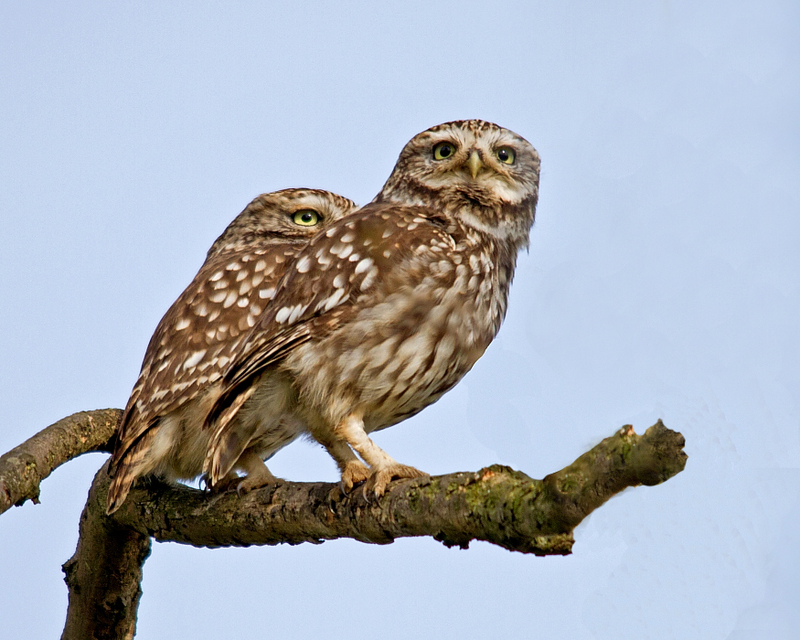 During the morning I also had some good news, whilst driving across some fields I chanced upon a brand new pair of Little Owls, site No 205! I've driven down this particular track on dozens of previous occasions and never seen an owl here before! I can only assume they are last years juveniles that have paired and set up a new territory? The tree I saw them in is very near to a couple of nest boxes that I erected last year, here's hoping they find one of them suitable and set up home. Not a bad few hours really, in total 11 owls were seen, 4 pairs and three singles across 7 different sites. To then top off the good morning the afternoon was just as good, City won 2-0.........time to have a celebratory drink I think! 11 Owls is superb! Great photos as usual! Love the shots of the pairs. The pair in the tree is a magical image Paul. I love that. Super - I love that third image Paul! !